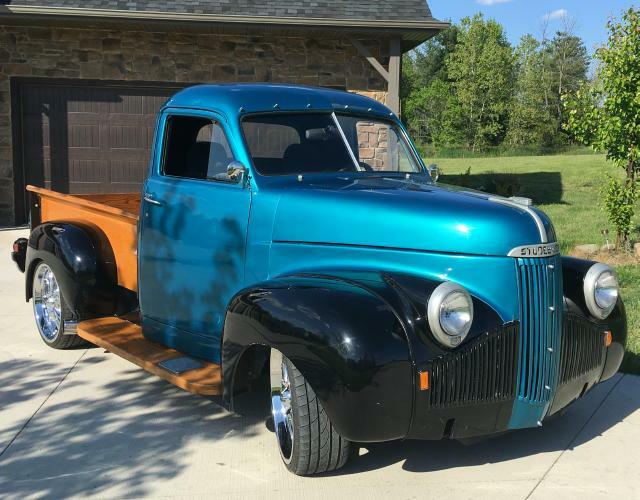 This outstanding Custom 1947 Studebaker M5 Pickup is owned by Brent Ritenour of Auburn, Indiana. 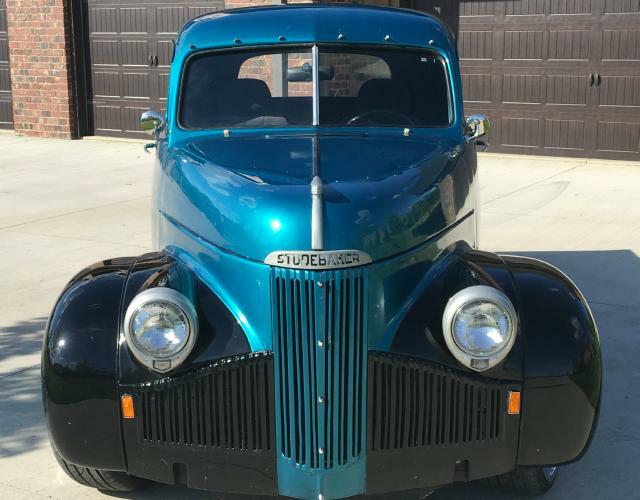 Brent satys that he searched for several years for Studebaker that would be a fitting tribute to his grandfather who worked on the assembly line in South Bend for 20-plus years. He ultimately found this already built Custom M5 in Southwest Michigan. 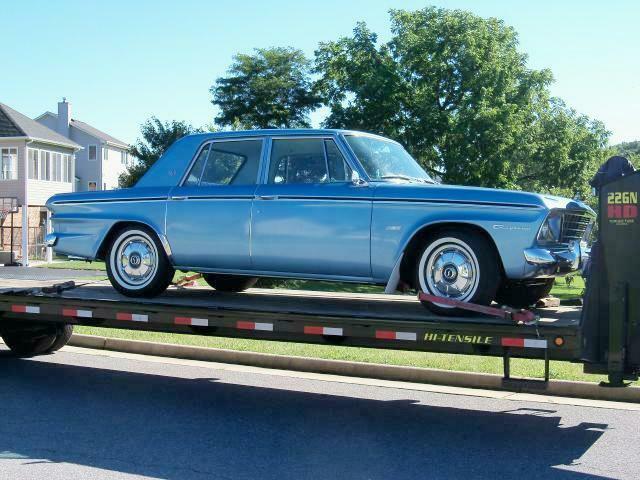 It had been listed several times on Craigslist in Michigan without generating any interested parties. 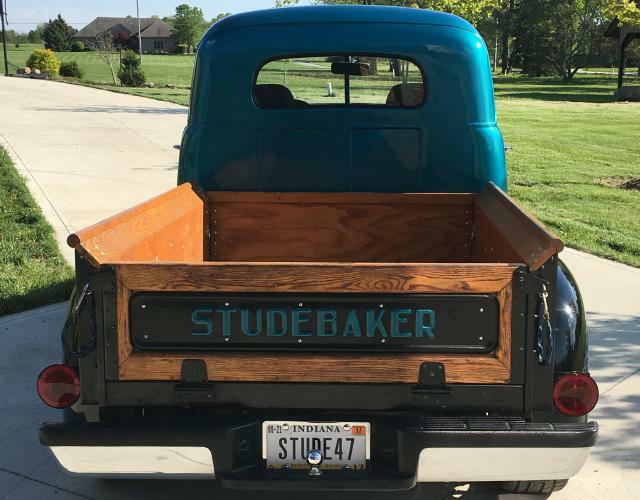 The owner decided to list the truck in Indiana because he felt that people in Indiana might have more interest in Studebakers. Brent saw the listing and bought it on the first day it was listed in Indiana. Brent's truck has a small block Chevy 350 engine with a GM Turbo-Hydramatic transmission and sits on a Chevelle frame. 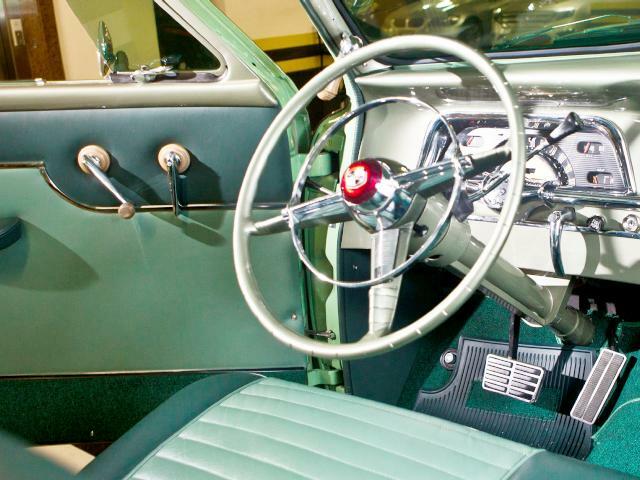 Inside it has a tilt steeering wheel and a full set of vintage style gauges. The pickup box and running boards are made of wood. Brent says that a great deal of time was spent on fabricating the box and that it is really the sweet spot on the truck. The truck has 20 inch wheels but retains the original drum brake system. Down the road Brent plans to change the interior over to lerather and to install a modern disc brke system. 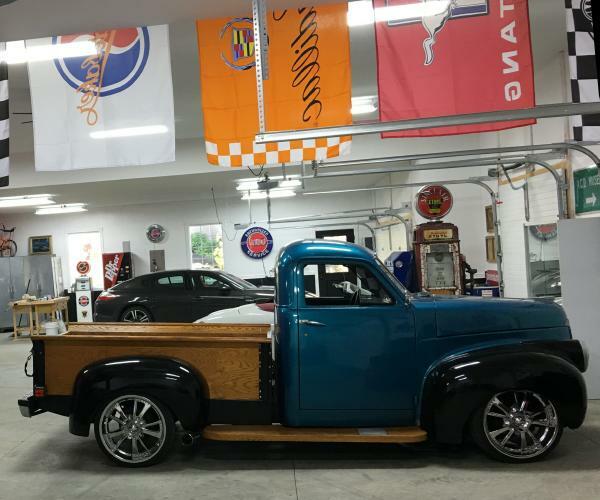 Here is another view of this beautiful truck inside of Brent's really cool garage. 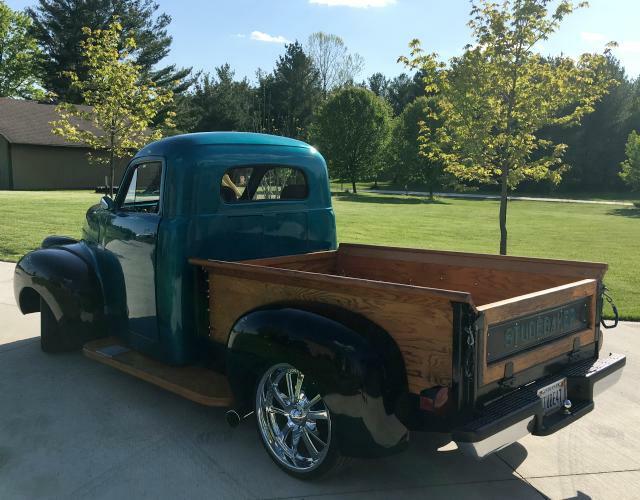 Thanks to Brent for sending the pictures and information about his beautiful Studebaker truck. 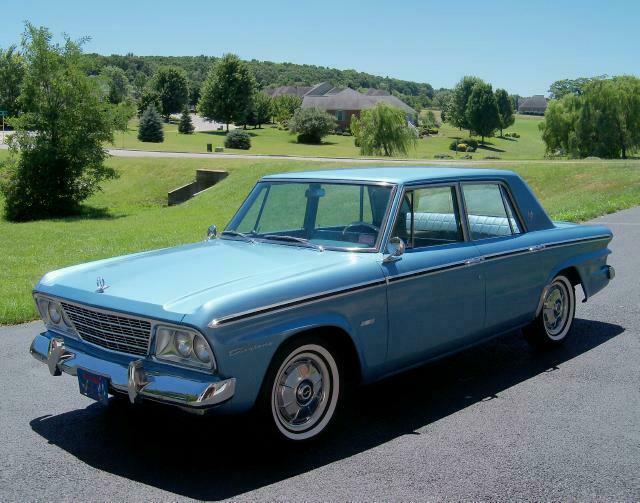 If you own or once owned a Studebaker or related vehicle and would like to see your car as "Stude of the Month" or in the "Cool Studes" section, or if you have other pictures or material that you would like to contribute to this page, please e-mail me here at wj2d44@gmail.com. I can accept either electronic or hard copy images. The Main Page is issued every other month so the next edition will be October 2017. 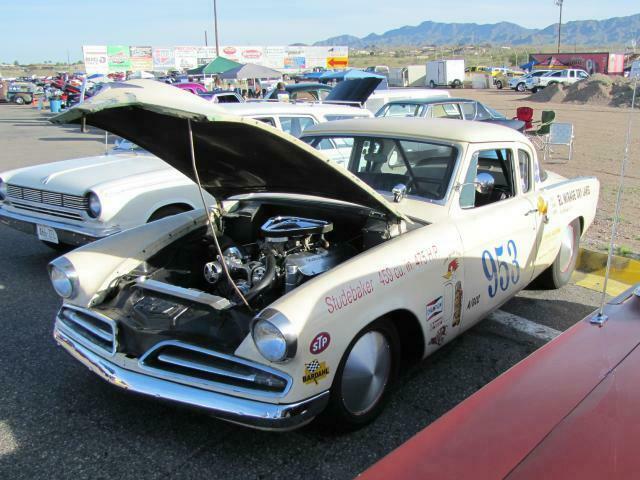 Bill Junge sent several pictures of this 1953 Studebaker Commander Starlight Coupe Dry Lakes Race Car with 1953 Alabama license plates. The pictures were taken at a local car show in Lake Havasu City, Arizona earlier this year. I don't know if this car actually completed at the El Mirage time trials or if it is a tribute car, but either way it is an impressive machine with a 459 cubic inch 475 horsepower engine under the hood. The exterior is period correct for a 1950's dry lakes racer and the lettering indicates ts competes in Class A/GCC. Class "A" is the second highest class behind "AA" (501 cubic inches and larger) and the "GCC" stands for "gas competition coupe." The Southern California Timing Assoctaion (SCTA) has sponsored land speed racing events at El Mirage for over 60 years. The lake bed is located in the Mojave Desert about 30 miles east of the high desert community of Antelope Valley. There are four single-day races and two two-day races each year running from May through November. Dry lakes land speed racing at El Mirage is a volunteer sport which depends on the continued active participation of clubs and individuals in the SCTA. More information on Studebakers in land speed racing competition can be found here. 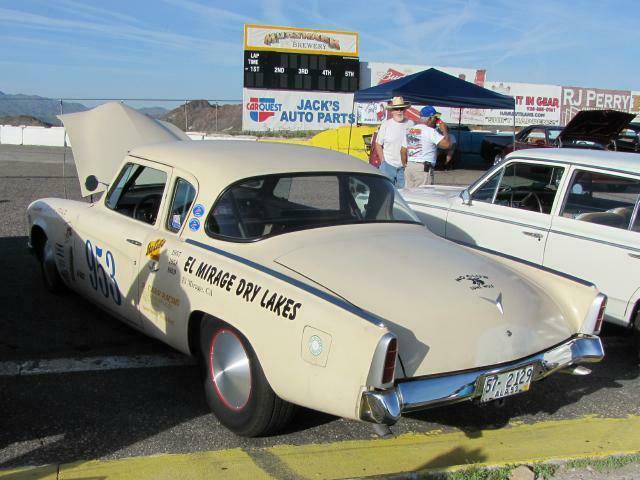 Thanks to Bill for sending the pictures of this neat Studebaker racer. 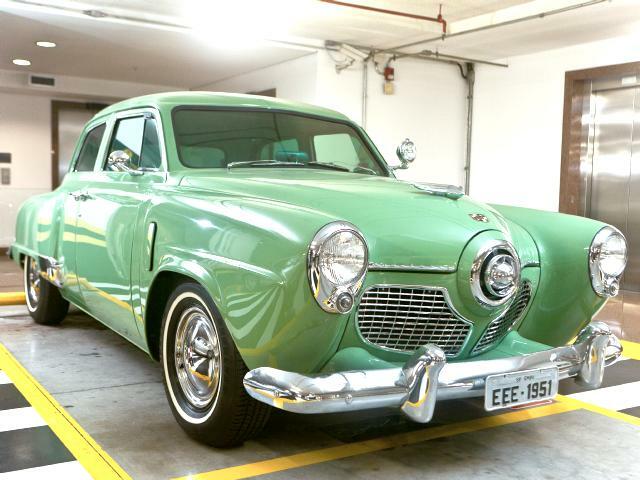 Rogerio Monteiro from Sao Paulo, Brazil sent in some pictures of his beautiful 1951 Studebaker Chanpion Sedan. 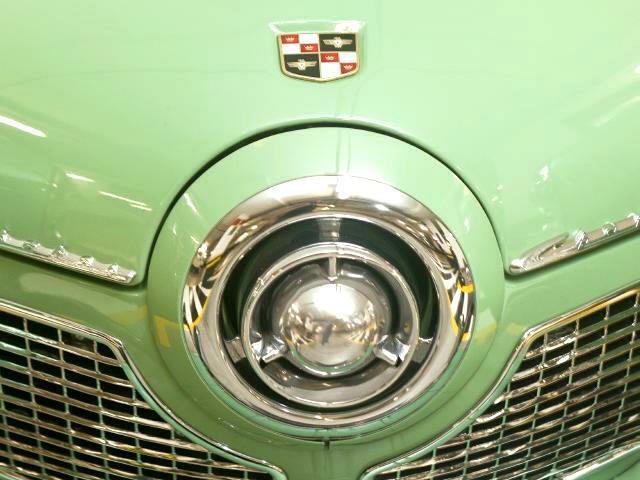 He acquired the car in 2005 and spent five years on its restoration. Rogerio says that when he got the car home it had rust everywhere and the interior was essentially destroyed. But he wanted a challenge and enjoyed searching for parts and working on what is now a beautiful example of a Bullet Nose Studebaker. Rogiero wanted a car that could be driven in heat and traffic so he made some modifications to achieve that goal. 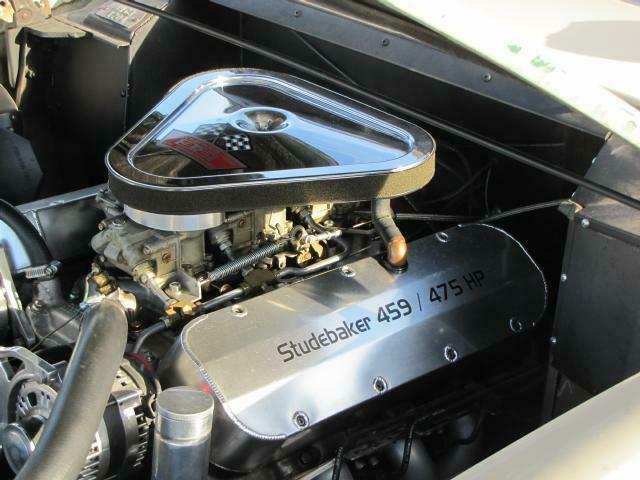 The original Studebaker flathead engine was replaced with a 1967 Mercury Comet engine with automatic transmission and the car has been converted to 12 volts in order to install a modern air conditioning system. In addition, the car has power steering and power brakes but retains its origional appearence. 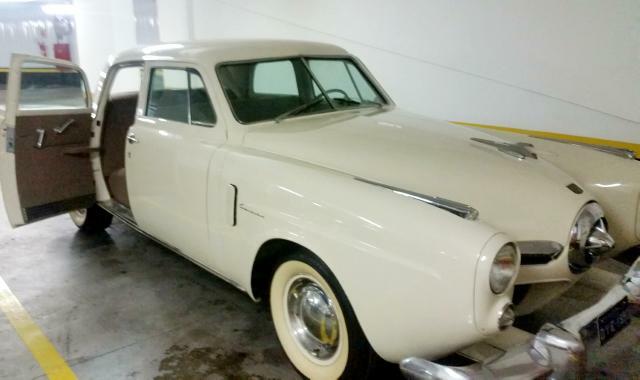 Rogiero also owns two 1950 Studebaker Commanders, one that has been fully restored as original and another recently purchased from a museum in California that he is currently working on. 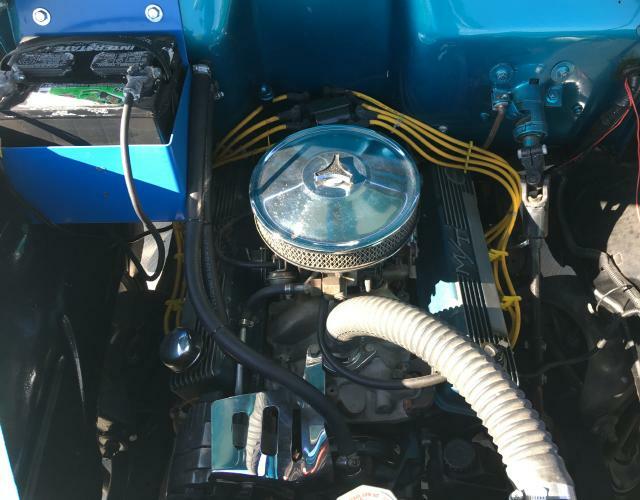 Thanks to Rogerio for sending the pictures and information about his really sharp Studebaker Cahmpion. Donnie Seal's 1957 Studebaker Champion Sedan Street Rod was featured on this page as Stude of the Month in October 2016 and appeared on this page again February 2017. The second round of pictures included the completed interior but the hood had not yet been installed. 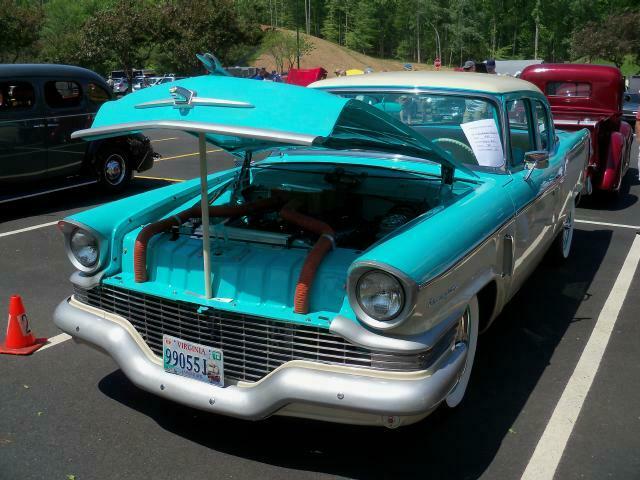 This car seems to pop up at many shows and events and when seen at the April 30, 2017 Piedmont Region AACA Car Show in Charlottesville, Virginia the hood had been installed. This picture was taken on Sunday, July 30, a few hours after the Daytona was trucked in and unloaded at my house. I did clean in up a bit and removed the door edge trim and front mud flaps before taking the picture. The front bumper guards are reversed in the picture which has since been corrected. I purchased the Daytona because it is a rust free New Mexico car with just over 65,400 miles, one repaint, a nice original interior, and a dash with no cracks. It has the 259 V8 with three-speed manual transmission and overdrive. This car spent the last 12 years in Pennsylvania during which time it appears to have been driven only a few hundred miles. It has a stainless steel dual exhaust system that looks brand new. One feature I don't care for is the optional oil bath air cleaner which I would guess was good to have in New Mexico. I found the car on Pittsburgh Craigslist and we went out to inspect and drive it several weeks ago. We could not find any signs of rust even in the floorboards and truck. It drove as it should and the overdrive was working properly. We did not buy it at that time but after some long-distance back and forth the asking price came down considerably and a deal was struck. My intention is for this to be a nice driver, not a show car. Particularly given the long period of relative inactivity, it needs some things done and I will be addressing these over the next several weeks before putting it on the road. There is no radio antenna because the car was ordered without a radio. One thing I will need to decide is whether or not to add a radio which will mean drilling a hole for an antenna which I am loathe to do. Updates on the Daytona's progress will appear in future editions of this page. Jim Amado of Utica, New York sent in a bunch of pictures of his Studebaker toy and model collection. 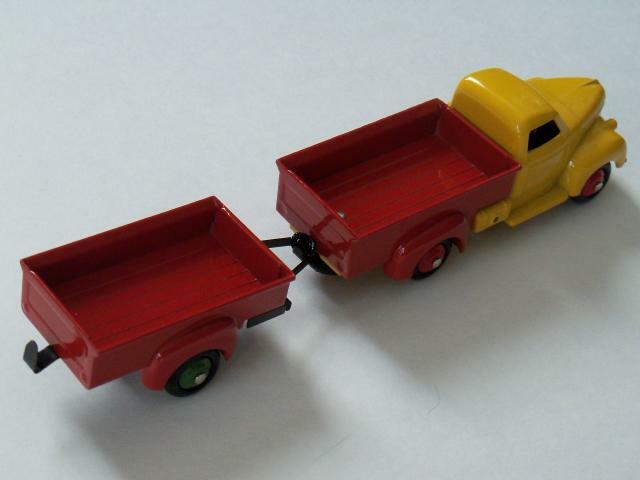 The 1947 M Series Stake Bed began life as an Ertl Pickup. The running boards were cut, the rear fenders and pickup box were removed, a stake bed and rack were added, and the wheels were painted black. 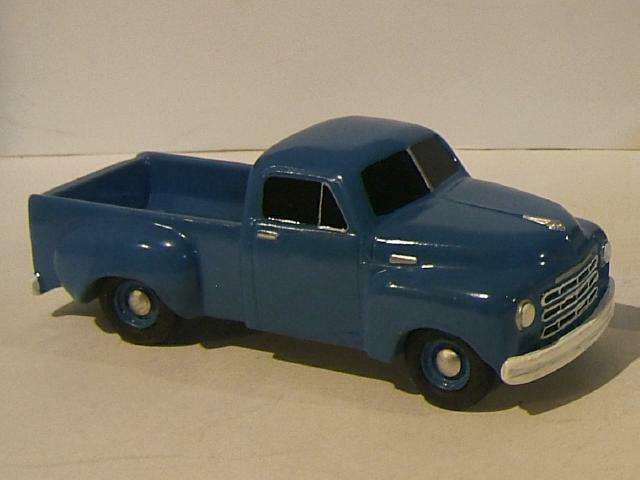 The National Products C Cab Pickup is a restoration and repaint with replacement wheels and tires cast in plaster. 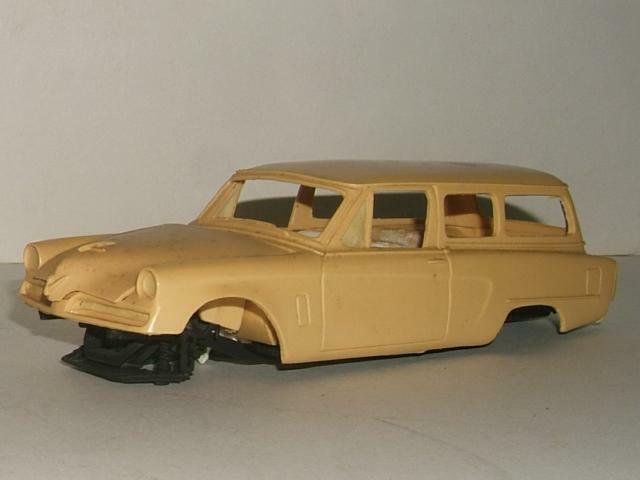 The 1954 Conestoga Station Wagon is a resin cast kit made by All American Models. An AMT 1953 Starliner kit was needed for parts to complete it. All American Models went out of business some time ago. 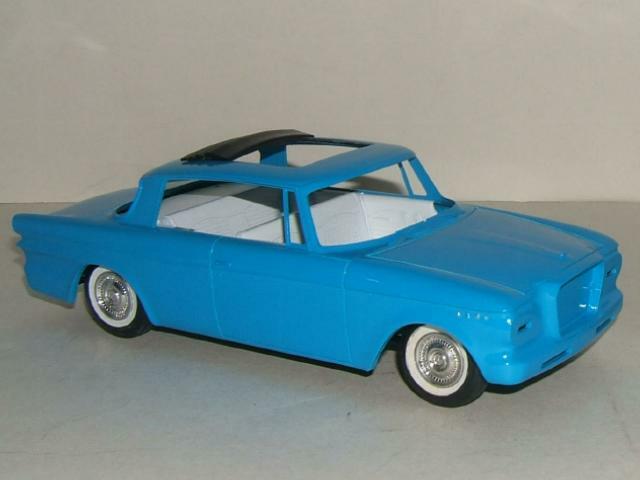 The 1962 Lark Skytop is a JoHan model kit with an opening cut into the roof and simulated folded top appropriated from a Volkswagen model kit made by Pyro. 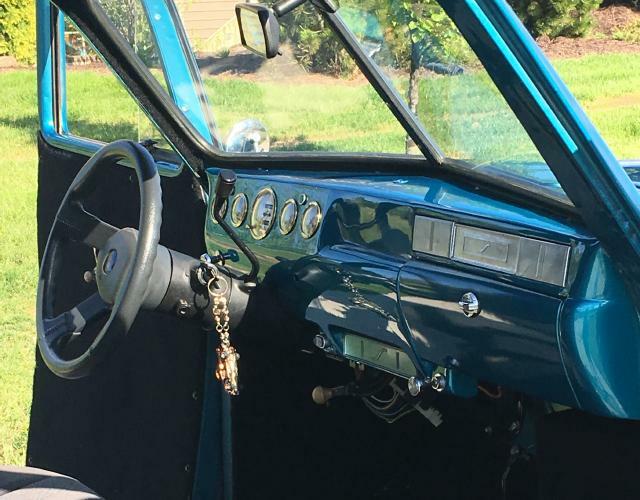 Jim writes that he has been a car nut ever since he can remember. He began tinkering with plastic models about fifty seven years ago and seriously building and collecting soon thereafter. Thirty eight years ago he opened a shop dealing in automotive related collectibles including scale models and automotive sales literature. It was a unique shop offering many unique products and services including custom built models of customer's vehicles. The shop closed in 2014 after 35 years in operation. 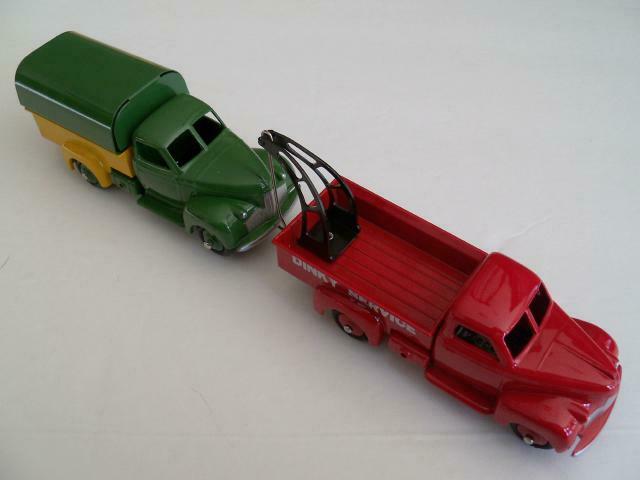 Jim has published a number of articles in both scale model and automotive publications, the most recent appearing in the August 2017 issue of Toy Trucker & Contractor. I'll be adding more models from Jim's collection to this page as space allows. Eventually there will be a separate page similiar to the one for I put up for Jeff Scion's Studebaker Toy Car Collection. 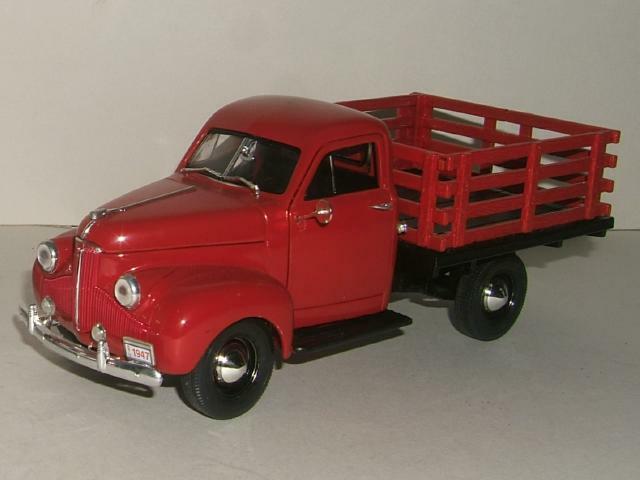 Atlas Editions continues to issue new versions of its 1:43 scale reproduction Dinky Studebaker M Series Truck. 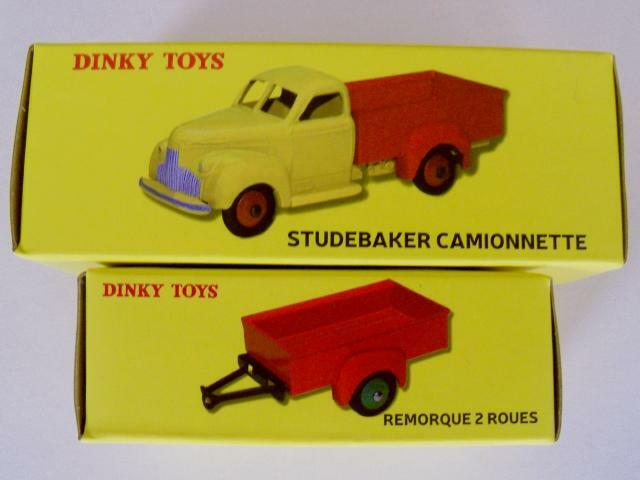 One of the more recent issues is the 25P Studebaker Camionnette with the 25S Trailer. 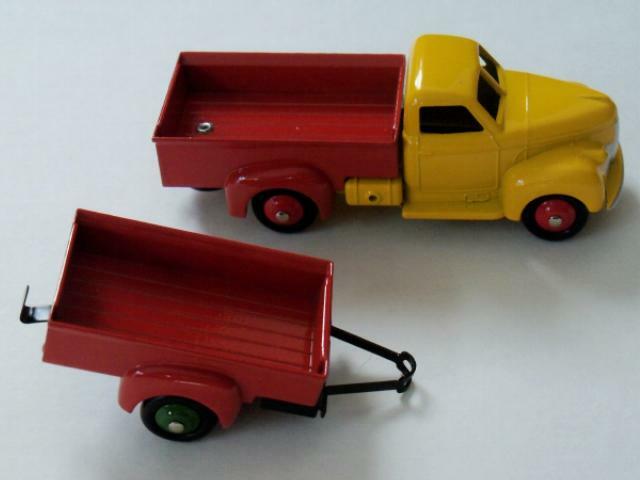 This very nice pair comes packed in reproduction French Dinky Toys picture boxes. 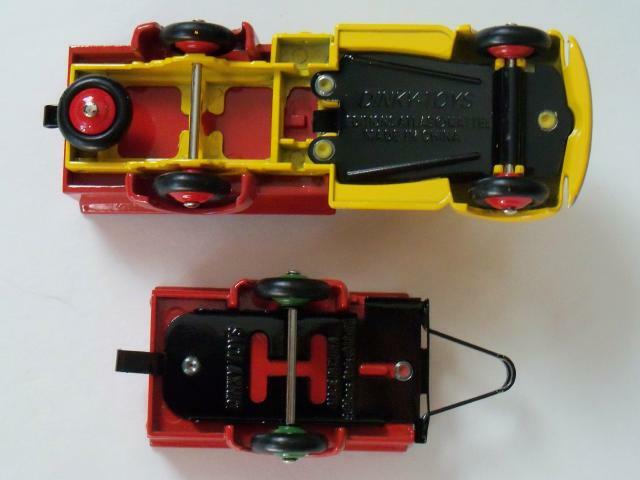 The are very accurate so much so that the tires can interchange with original Dinky Toys tires. 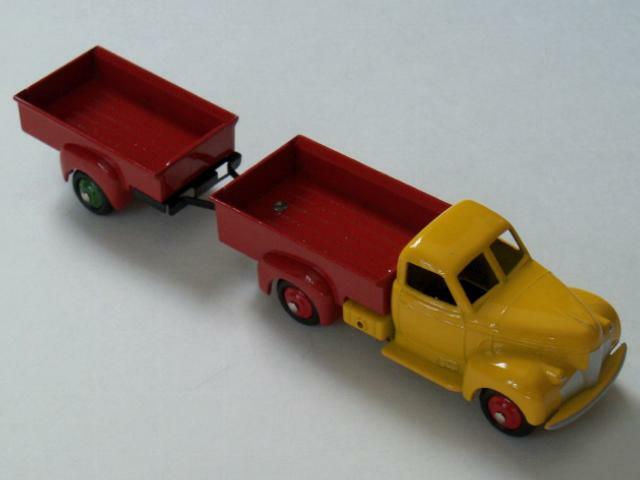 The original French Dinky issue of this pair can run as high as $500 in excellent condition. The bases of these models clearly indicate that they are reproductions made in China. The reproduction pair has appeared on eBay from vendors in China for as little as $25 with shipping. At that price it is truly a bargain to be had. 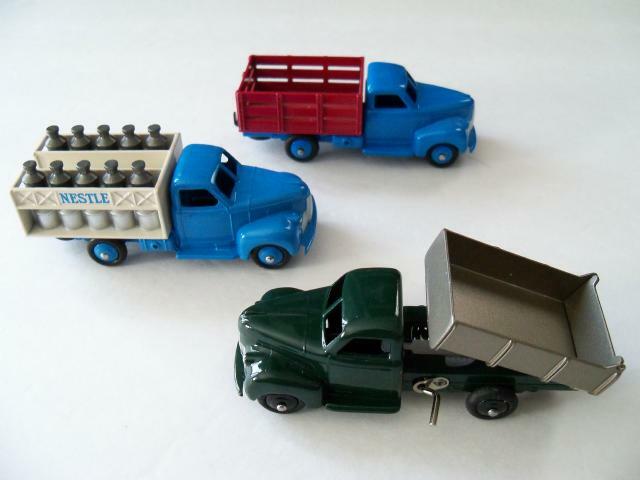 My collection of Atlas M Series Studebakers includes a wrecker, a covered back truck, a stake bed truck, a milk truck, and a dump truck. The wrecker was featured in February 2017, the milk truck was featured in February 2016, and the stake bed was featured in June 2015. Here is a picture of the wrecker and covered back and here is a picture of the stake bed, milk truck, and dump truck. 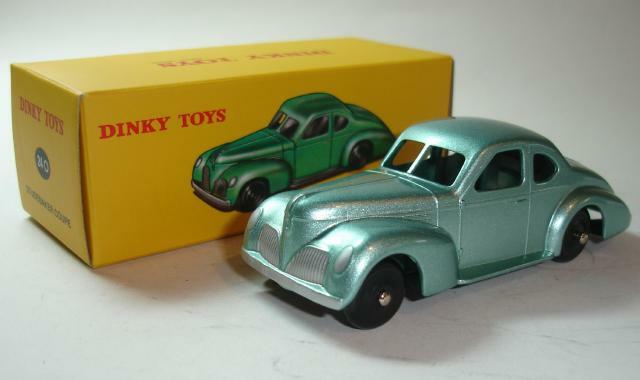 In addition to the Studebaker M Series Trucks, the reproduction Atlas Dinky line also includes a 1939 Commander Coupe and a 1955 Commander Hardtop.